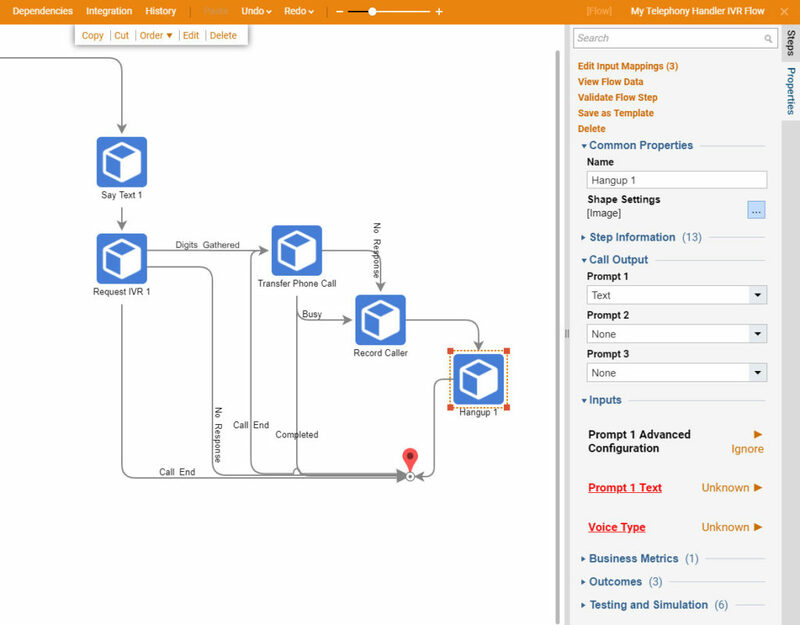 Using a Telephony service like Twilio or Plivo, Decisions can respond to inbound calls using the IVR (Interactive Voice Response) requests. This document explains how to configure Decisions to respond to such a request. 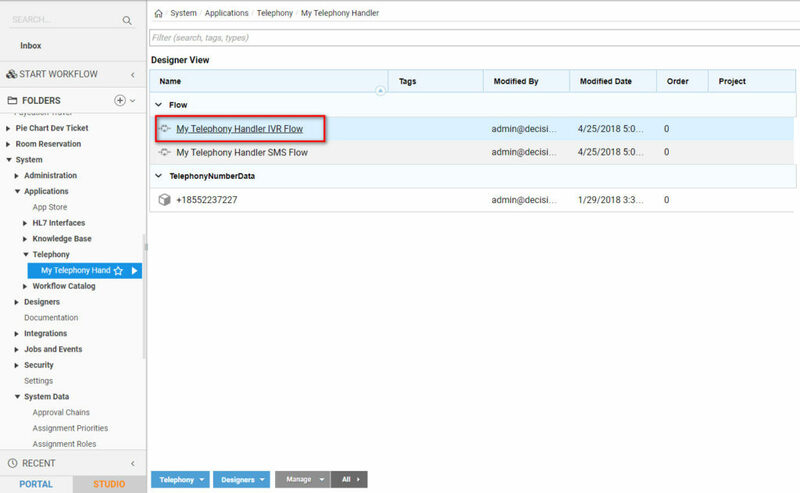 In your Telephony Handler folder, edit the [Name of Telephony Handler] IVR Flow	. This is the flow that runs when a number in the telephony handler is called. 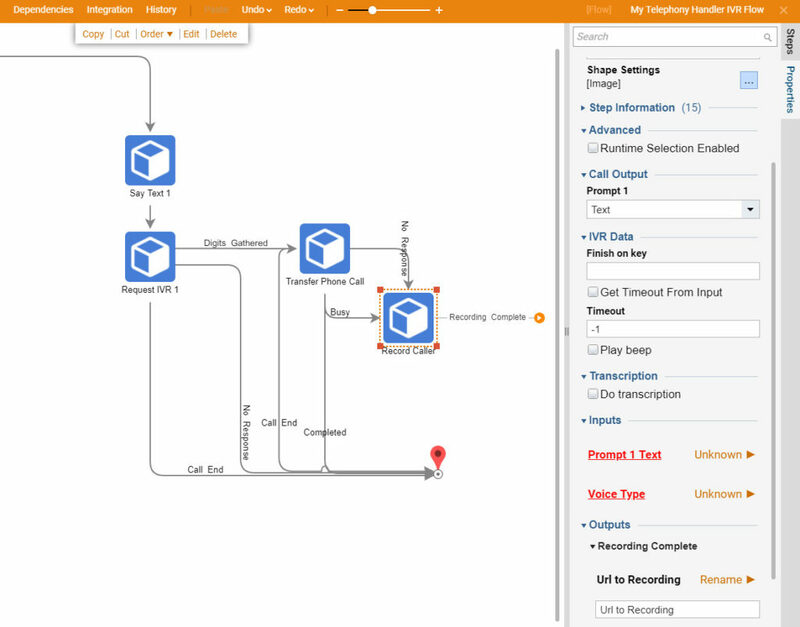 To begin your IVR flow, in the Flow Designer’s startup window navigate to All Steps [Catalog] >	Communication > Telephony > Phone	and select the Say Text	step. Click Add	to place it onto your model. This step can be used to explain the IVR menu to the caller. RecordingDocument	: This will play an audio file from the supplied Decisions Document id. Text	: This will use an automated voice to read the text you enter. Voice Type:	This will change the automated response to a Male or Female voice. 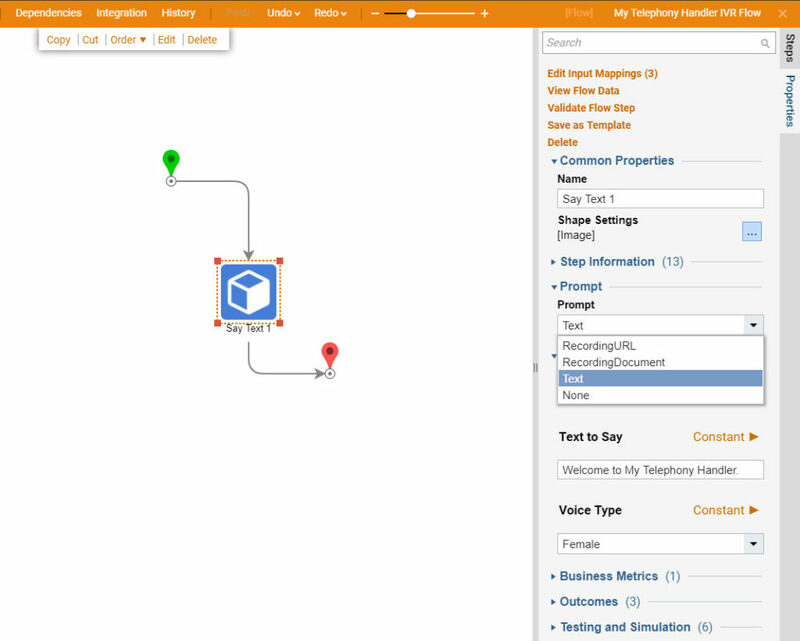 The Request IVR	step can be used to gather IVR (Interactive Voice Response) data from the caller. When a valid IVR response is received, this step will exit via the Digits Gathered	path. Prompt 1	: This property provides the same functionality as the Say Text	step and can be used instead of it. The value of Prompt 1 is read first. If an invalid response is given, the value of prompt 2 is read and then prompt 3. Number of digits	: the expected number of digits in the IVR response. Timeout	: The number of seconds to wait for an IVR response. The checkbox “Get Timeout from input” will let you map this value as input data. If the value is set to -1 the step will wait indefinitely for a response. Finish Key :	The key to signal the end of an IVR response. Process Only Valid Replies:	This allows for specified responses to be entered. Any response not in this list will be considered invalid. 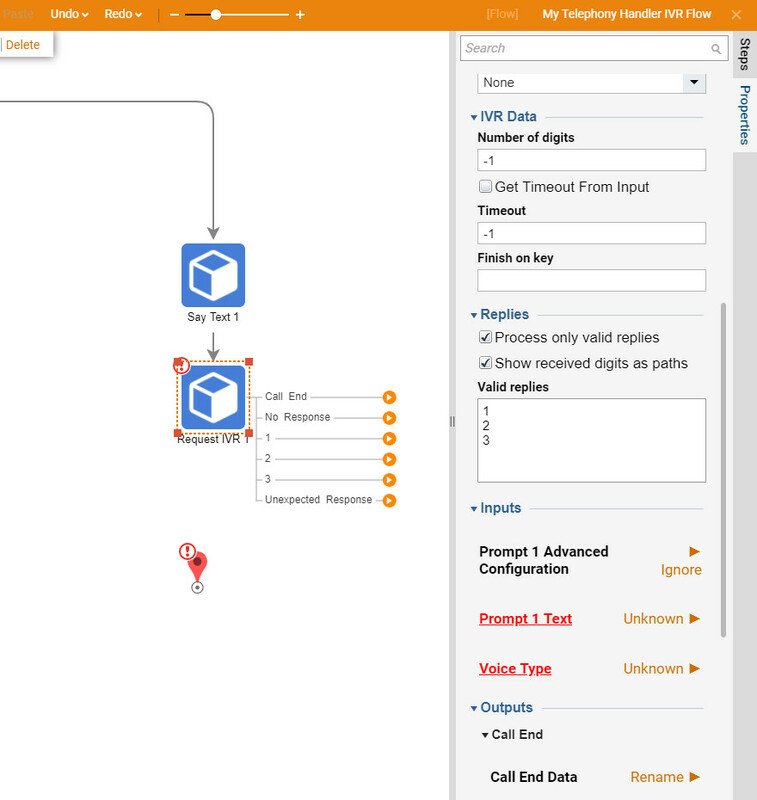 Show Received Digits as Paths:	This will create individual paths for the valid responses that are specified. The Transfer Phone Call	step is used to transfer a phone call to an external or internal Phone Number. Time Limit:	The time limit in seconds of the phone conversation. Record Call:	This allows for the conversation to be recorded or not based on preference. Timeout	: The number of seconds the call rings before ending with No Response. The checkbox “Get Timeout from input” will let you map this value as input data. Prompt 1	: This property provides the same functionality as the Say Text	step and can be used instead of it. The prompt will play before the call is transferred. To Phone Numbers:	The number or numbers the call will be transferred to. End Call:	This is the path the flow continues down if the call was ended by the caller. 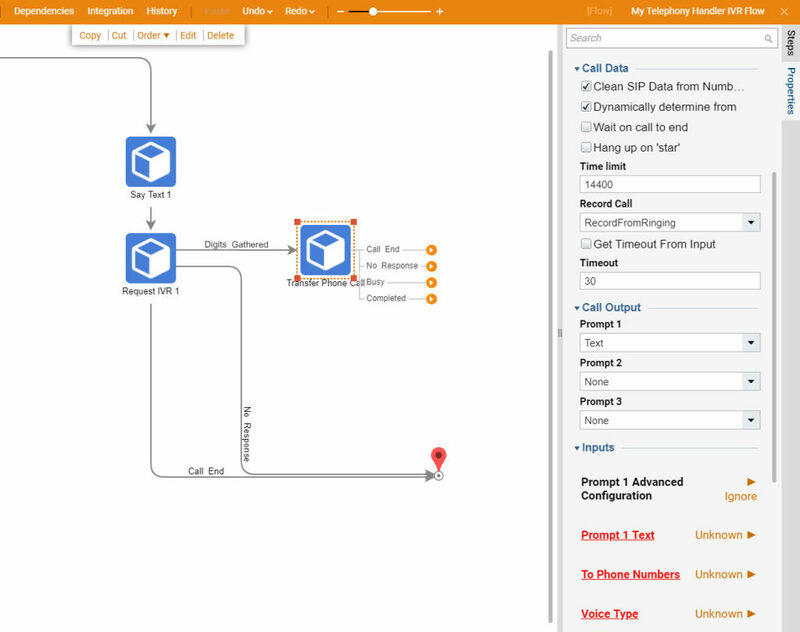 Completed:	This is the path that the flow continues down if the person transferred to hangs up the call. Busy:	The phone number the conversation is being transferred to is currently Busy. No Response:	The flow will continue down this path if the Timeout was reached. The Record Caller	step can be used to record the caller after a beep and/or prompt. 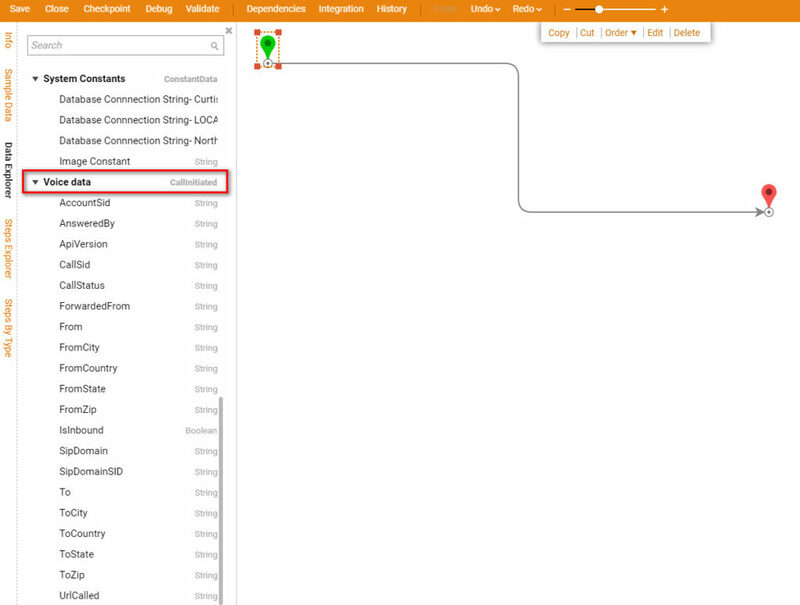 Generally this is used for voicemail type recording and will output a URL to the recording once it is completed. Prompt 1	: This property provides the same functionality as the Say Text	step and can be used instead of it. The prompt will play before the call is recorded. Finish Key :	The key to signal the end of the recording. Timeout:	The time limit of the recording in seconds. Play Beep:	Option to play a tone or not after prompt is finished. 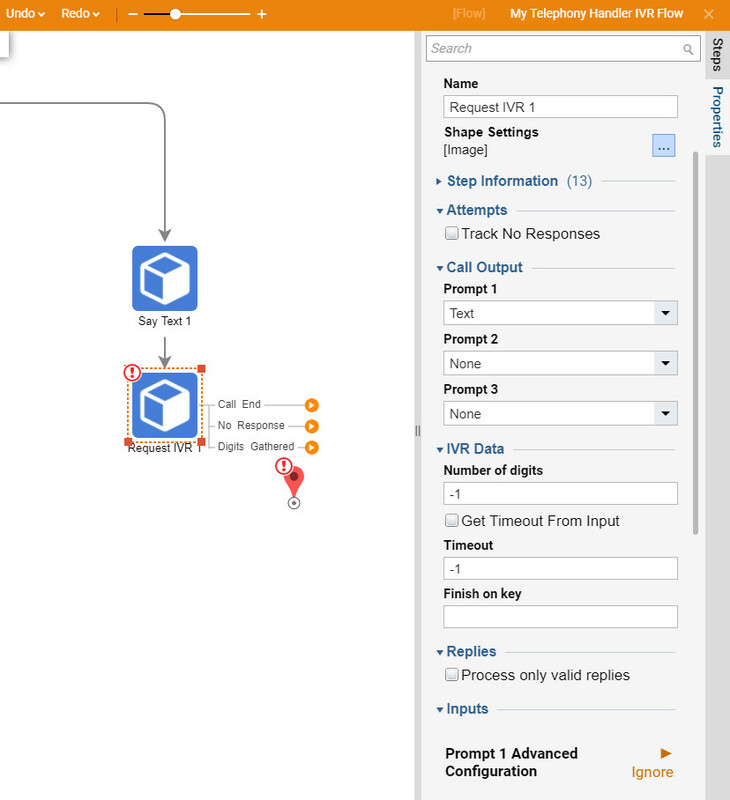 The final step you should use in an IVR flow is the Hangup	step.This step has the same Prompt options as the other steps. After reading the Prompt value (if any) the step hangs up the call.